Bob Waggoner was born in 1935 in Jansen, Utah, and grew up in Steamboat Springs, Colorado. He enlisted in the Aviation Cadet Program of the U.S. Air Force on April 14, 1955, and was commissioned a 2d Lt in the Air Force and awarded his pilot wings at Laughlin AFB, Texas, on July 28, 1956. Lt Waggoner next completed All-Weather Interceptor training and F-89 Scorpion Combat Crew Training at Perrin AFB, Texas, before serving as an F-89J pilot with the 54th Fighter Interceptor Squadron at Ellsworth AFB, South Dakota, from January 1957 to December 1958. He then served as an F-89D pilot with the 59th Fighter Interceptor Squadron at Goose Bay, Labrador, from December 1958 to April 1960, followed by Weapons Controller training at Tyndall AFB, Florida, from April to June 1960. His next assignment was as a Weapons Controller/Director with Detachment 1 of the 728th Air Control & Warning Squadron at Pope AFB, North Carolina, from June 1960 to December 1963, and then as a T-39 Sabreliner instructor pilot with the 4500th Air Base Wing at Langley AFB, Virginia, from December 1963 to August 1966. Capt Waggoner served as an F-105 pilot with the 469th Tactical Fighter Squadron at Korat Royal Thai AFB, Thailand, from August 1966 until he was forced to eject over North Vietnam and was taken as a Prisoner of War on September 12, 1966. After spending 2,366 days in captivity, Maj Waggoner was released during Operation Homecoming on March 4, 1973. He was briefly hospitalized to recover from his injuries at Travis AFB, California, and then attended Air War College at Maxwell AFB, Alabama, from August 1973 to August 1974. He next completed instructor pilot training, and then served as a T-38 Talon instructor pilot, as a Wing Flight Examiner, and as Commander of the 86th Flying Training Squadron of the 47th Flying Training Wing at Laughlin AFB from January 1975 to May 1977. 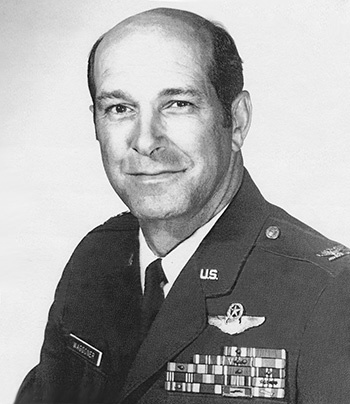 After completing an additional service college, Col Waggoner's final assignment was as Deputy Commander and then Commander of the Air Force Plant Representative Office with Hughes Aircraft Company in Los Angeles, California, from May 1978 until his retirement from the Air Force on August 1, 1981. 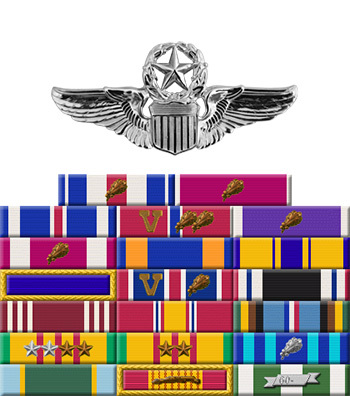 Captain Robert F. Waggoner distinguished himself by gallantry in connection with military operations against an opposing armed force near Hanoi, North Vietnam on 4 September 1966. On that date, Captain Waggoner was a member of a flight of F-105's assigned to seek out and destroy SA-2 missile sites which became a threat to friendly aircraft attacking targets within fifteen miles of Hanoi, North Vietnam. Barely escaping death from two exploding SA-2 missiles and while under extremely heavy and accurate anti-aircraft fire, he attacked and destroyed a SA-2 surface-to-air missile site, along with its controlling radar. By his gallantry and devotion to duty, Captain Waggoner has reflected great credit upon himself and the United States Air Force.